Hey Barred Owl! You’re going to need a permit! Summertime provides ample opportunity to get out and follow your Adventure Foot, and one of the very best ways to do that is to go camping! Whether you’re tent camping with the kids out of the back of the mini-van or planning a backpacking excursion “off the grid,” a few simple steps can make your next camping trip a safe and fun adventure! 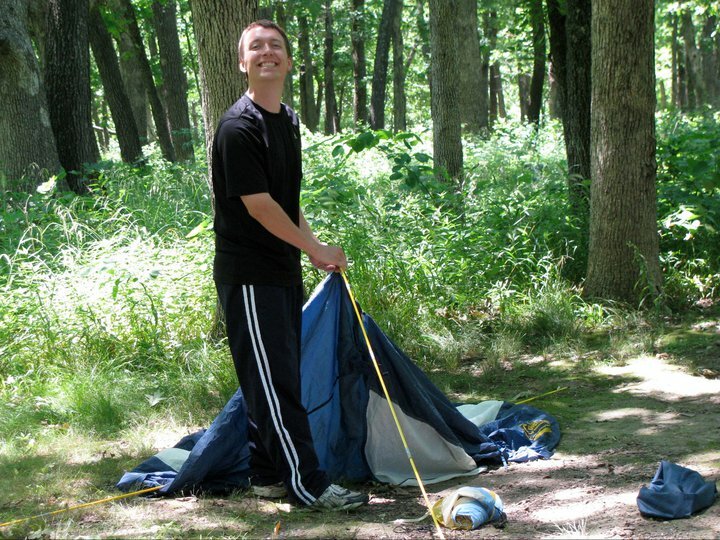 We’ve all forgotten something important on a trip before, but when we forget something important on a camping trip, it tends to cause more inconvenience than usual. I’ve found that the way to become a better camper and to forget fewer things is to make a list! Make a list of the items you’ll need and lay the items all out on the kitchen table before you start packing them in your bag. When all your items are laid out, you can make sure you haven’t forgotten anything crucial to the trip- matches, bug spray, sunscreen, toilet paper… don’t leave home without them! Just as important as what you bring is what you do not bring. If you’re taking the kids, leave the Nintendo DS at home! Camping time is unplugging time and you will thank yourself for giving all the technology a rest. Also look for things you can leave out of your life for a day or two. Pare down the things you’re bringing to just the necessities. Decluttering is part of the beauty of the outdoors. Besides, whatever you don’t bring, you don’t have to carry! I like to keep a running list for camping trips. At the end of the trip, I look to see if there are any items in my pack that I haven’t used at all, and I cross those off for next time. It lightens the load and helps me to be a more efficient camper. Likewise, if some item would have made my life easier, I add it to the list and next time I’ll have it! Fire safety is every camper’s responsibility. 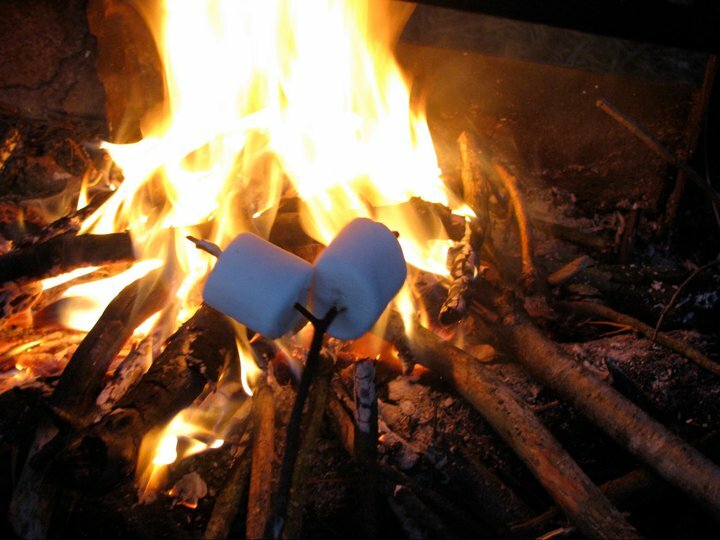 When building a fire, find out if the campground or space has any rules in place for fire building. Check for dry conditions and don’t build fires any larger than necessary. Fire pits or rings are great assets at campgrounds; use them! They’ll keep the debris all in one place and also help keep the fire from spreading. If there is not a fire pit, look for a campfire site that is downwind and at least 15 feet away from shrubs, overhanging branches, tents or any other flammable objects. Please remember: do not transport firewood from one place to another. There is plenty of loose wood around to collect and burn, and moving firewood is one of the main vectors of invasive species like the extremely destructive Emerald Ash Borer Beatle. 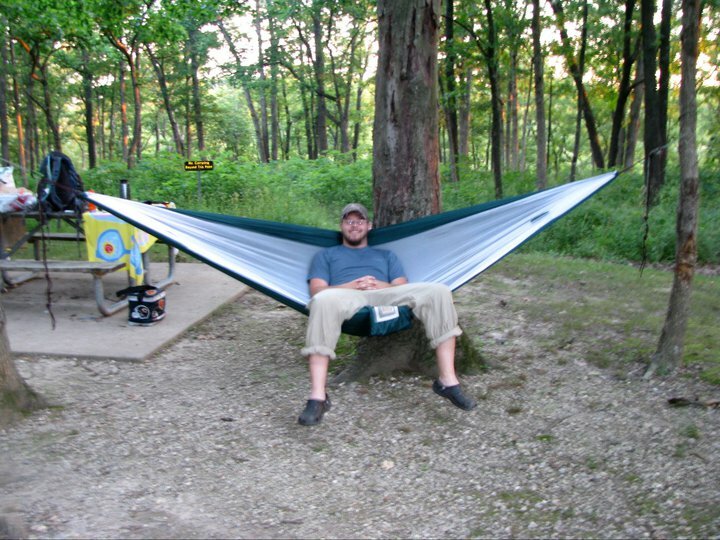 I love Ryan’s trail hammock. Lightweight and even has a bug shield. Water, shelter, food, and waste disposal. That’s what you’ll need for a camping trip. If you’re heading out to a state park or campground, water might be easy to come by and all you’ll need is a few water bottles. If you’re backpacking or going on an especially long hike you may need to bring water purification equipment or tabs. Plan ahead and know where your water sources are. Shelter is important too. Check the weather forecast before you go and pack appropriate gear. In my experience, a forecast for 25% chance of rain turns to 100% if I forget my tent’s rain fly or my poncho. It’s just the way it works. Also, pack appropriate gear for the temperatures. You don’t need that sub-zero sleeping bag if it’s not going to dip below 70 degrees at night. Likewise, a nice day doesn’t guarantee a warm night, so check and double check the forecast! It’s not a bad idea to look for safe places to go in case of a storm even if none are forecast. Food safety is especially important on camping trips, and I’ve heard more than one story of a great camping trip spoiled a day later by intestinal distress. Don’t forget your safe food handling practices just because you’re out in the woods. Make sure you cook any meat you are eating thoroughly, be aware of opportunities for cross contamination (don’t touch the fish and then the apples!! ), and store food safely. Make sure you’re storing your food and trash out of the reach of wildlife too. Even though there aren’t bears in Illinois, a cranky raccoon wandering through camp isn’t much fun either. 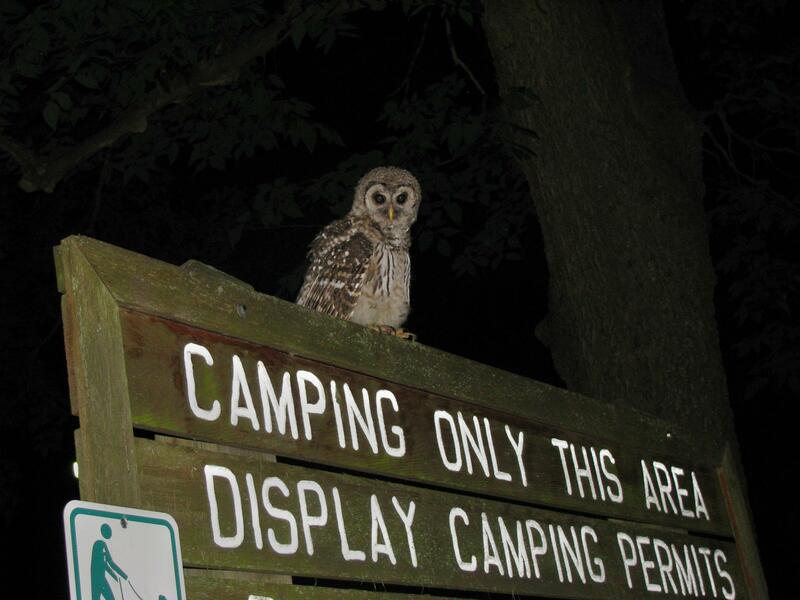 Check the Visitor Center for park rules and regs! Waste disposal doesn’t often get much forethought, but it’s important to plan for too. Bring trash bags and make sure you keep your campsite clean. You’ll often hear the phrase, “leave no trace.” This basically means: bring everything out of the woods that you took into the woods. And while we’re on the subject of waste… sometimes you’re by a porta-john or latrine, and sometimes you’re not. If you’re in the back country, protect the ecosystem and other travelers by following trail rules. This often means digging a small hole 10-15 feet off the trail and away from any water sources, doing your business, and covering it up. If my cats can cover up their dootie, so can you. In especially delicate ecosystems, you may be required to bring any solid waste with you out of the woods. Obey rules and posted guidelines! My smartphone has Google Maps, a flashlight, and can call 9-1-1. Guess what doesn’t usually work in the woods though? My cell phone! Come on people, you knew that! Make sure you’re bringing several light sources for your trip. I’m a fan of hands-free headlights and small LED flashlights. On longer backpacking trips, I like a hand-crank flashlight and radio combination, which can be used regardless of battery life. Bring basic first aid equipment for emergencies and even consider a flare or other signaling device if you will be a long way from emergency services. And bring a printed park map. Keep the printed map in a plastic bag or have it laminated. The last great piece of camping advice comes to you courtesy of my grandpa. He said, “Beware of things that bite, sting, itch, or get you all wet!” Make a list of the hazards you might experience in the area you’re camping. Know how to identify poison oak and poison ivy. Know how to identify and safely remove ticks. Know if anyone in your party is allergic to bee stings and bring appropriate first aid materials for that person. Know how to identify a potentially hazardous snake or a harmless one (clue: most snakes in our area are harmless). And lastly, be aware of any water hazards, especially if you have kids around. Don’t build your tent close to the creek; flash floods can happen whether it’s raining where you are or not. Keep the kids away from lakes or ponds after dark. Don’t cross flooded streams. Just use your common sense! 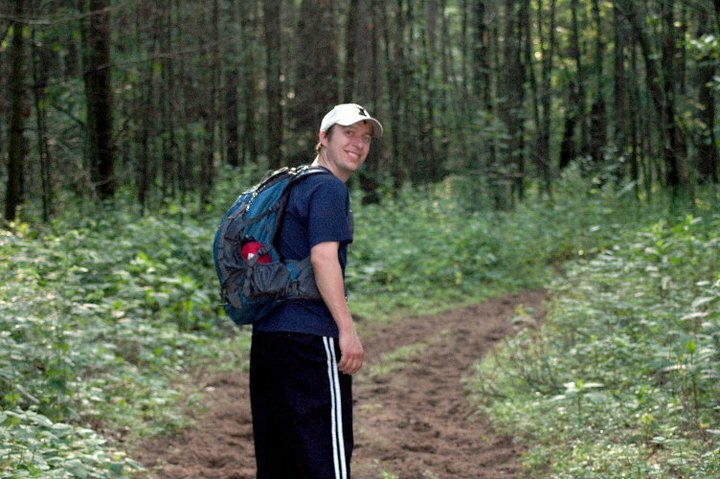 Justin out on a long hike! So there you have the Adventure Foot Guide to Safe and Fun Camping! 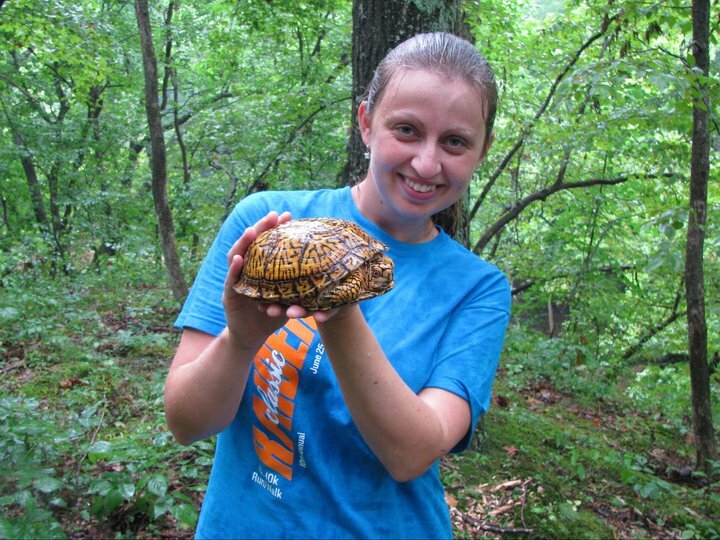 Be sure to check out these related blogs about some of my favorite local state parks. I highly recommend Wakonda State Park in La Grange, MO, (second winter Wakonda link here!) 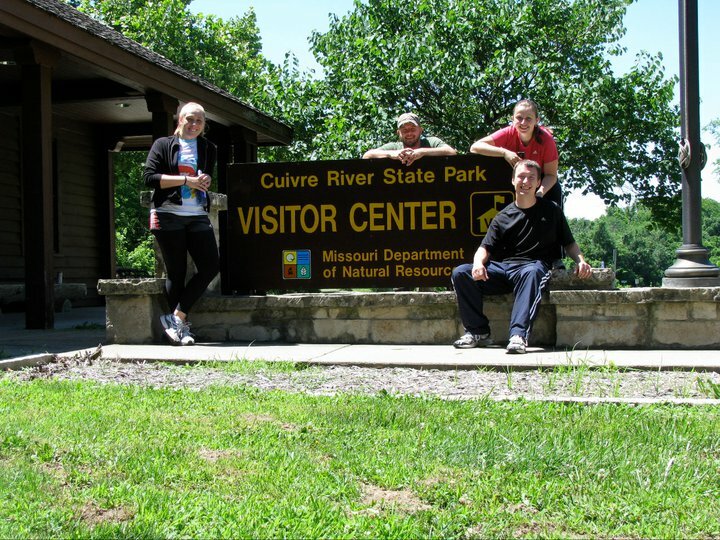 Cuivre River State Park in Troy, MO and Siloam Springs State Park in Liberty, IL (second Siloam link here!) for local camping adventures. You might also check out Sand Ridge State Park near Peoria. This park is enormous and especially fun in the late fall and winter! Oh and don’t forget Mark Twain Lake! There’s no excuse not to camp with so many great places to go! This past weekend, my husband and I had the opportunity to check out Quincy’s newest outdoor attraction, “River Skate.” The business, owned by Quincy natives Chris and Marion Dye, opened last week on the Quincy Riverfront. 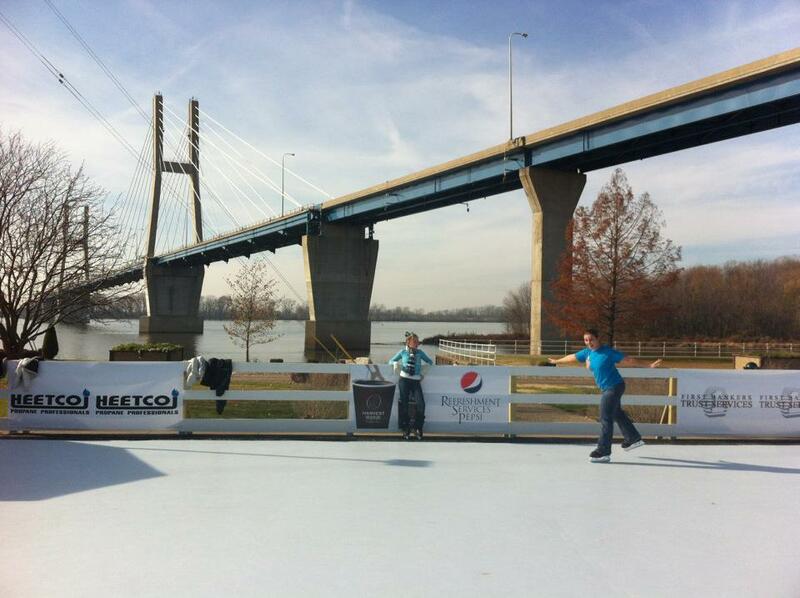 River Skate is much what you’d expect from an outdoor ice rink. Patrons are greeted by a friendly staff at a cute wooden warming hut where they can rent hockey-style skates in all sizes and pick up Pepsi, hot chocolate or snacks. The staff is happy to help you find the right size skates and even help the kids get laced up and moving on the rink. There are benches to change into your skates and to tuck your shoes underneath. 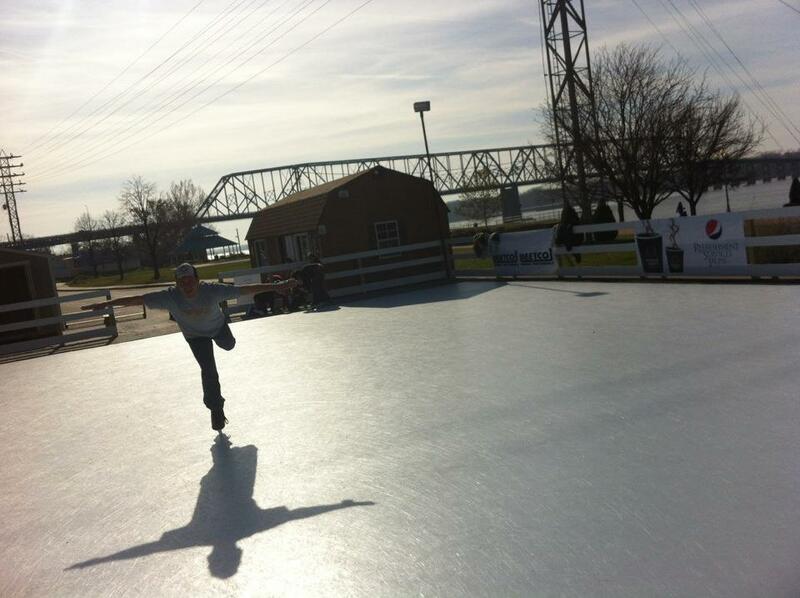 There’s just one major difference between River Skate and your average outdoor rink- it’s that River Skate has no ice! But the real question was: how would the synthetic ice feel to skate on? The answer: it was great! Justin and I laced up some freshly-sharpened skates and stepped tentatively out onto the surface, and after the first ten feet I could tell that River Skate was really on to something great. The surface felt smooth and unbroken and just like regular ice. The synthetic surface even peels up a little around your skates and creates a sort of synthetic ‘snow’ that clings to the outside of the blades. 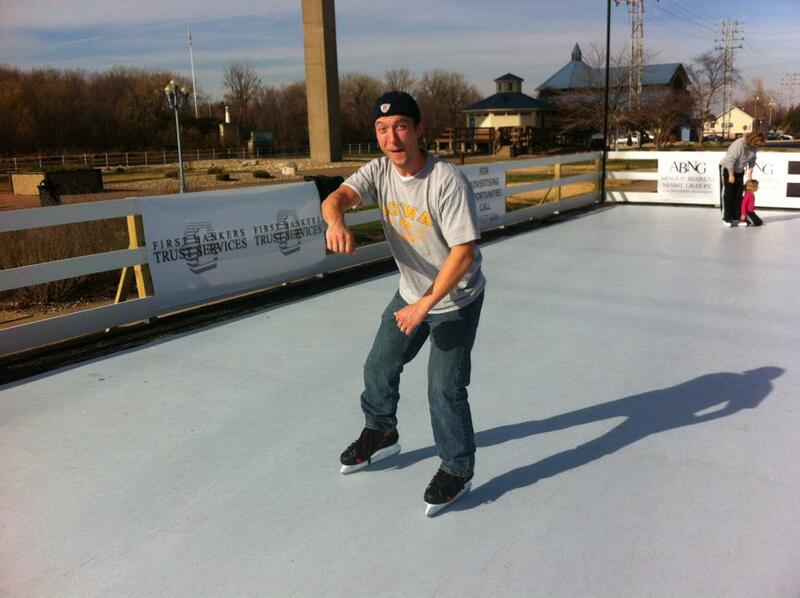 To this untrained skater, there was no noticeable difference between this surface and an ice rink. Well, that’s not true. There was one noticeable difference: I wasn’t cold! It was gorgeous outside and we were skating in t-shirts! Quincy’s climate just isn’t consistently cold enough to freeze an outdoor rink, and refrigeration that’s required of regular ice is both loud and expensive (besides, where would you get a Zamboni in Central Illinois??) so synthetic ice is a great fit for this area. 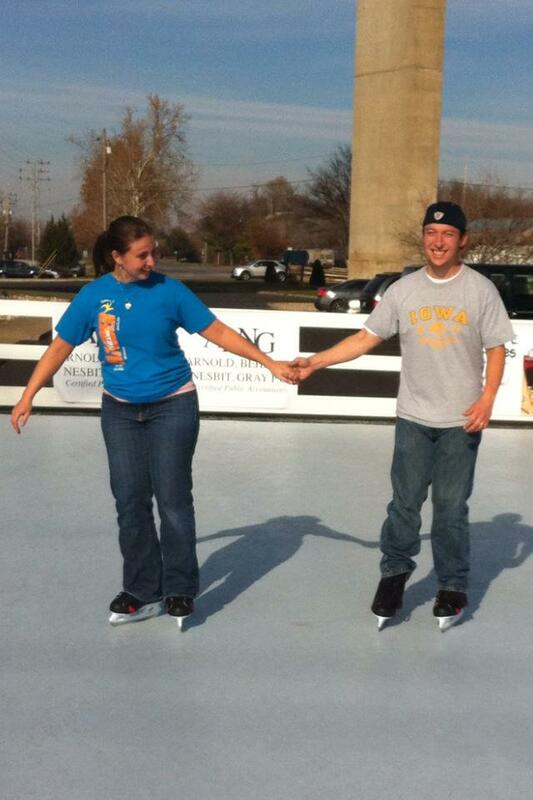 Justin and I really enjoyed our afternoon on the ice. It’s an innovative use of Quincy’s riverfront area and the Bayview Bridge makes a photogenic backdrop for all the fun. I loved that the rink pipes fun music out while you skate- you should have seen Justin skate Gangnam Style…! There were maybe 15 other skaters on the rink when we were there- a good mix of kids and adults- and more arriving when I was finally worn out and ready for some lunch. Owner Chris Dye explained that there are going to be some great theme-night skates coming up, and that the regular hours will also be expanded while kids are out on winter break. 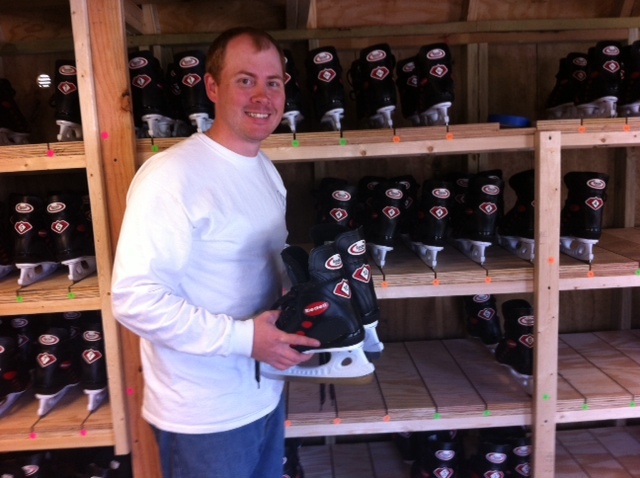 Owner Chris Dye shows off the great new hockey style skates. Patrons are also allowed to bring their own skates (any style) provided the staff checks them for safety first. COST: Only $3 for kids and $5 for adults. Includes skate rental and admission. Concessions available at additional cost. River Skate accepts cash and major credit cards. Punch cards are also available. PRESENTED BY: Title presenter is Refreshment Services Pepsi. Also presented by Rokusek Design, ABNG CPAs, First Banker’s Trust, Quincy Medical Group, Town and Country Bank, Heetco, Quincy Area Convention and Visitor’s Bureau, Rupp Rental, Mercantile Bank and Blessing Hospital. 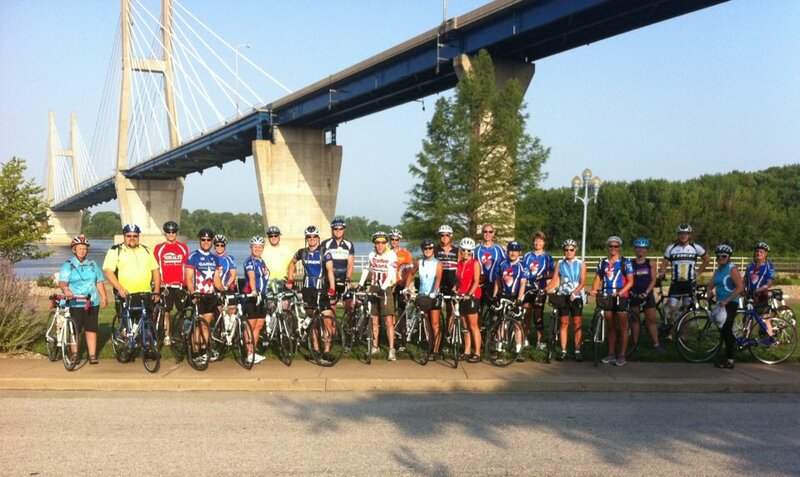 I organized a Bridge to Bridge (Quincy to Hannibal and back) ride for the 4th of July, and despite the high temps, attendance was GREAT! I’m so happy so many people came out for this and I hope we do it again next year! Many apologies for the lack of blogs lately. It’s not for want of topics, rather for lack of time for coherent, thoughtful writing! Ah well, we all get busy sometimes I guess. So here’s my attempt at catching you up with the goings on that have been going on. Friend-of-the-blog Jared Busen and I got a bike ride in just this week. What I’ve primarily been up to is biking my little Adventure Foot right off! 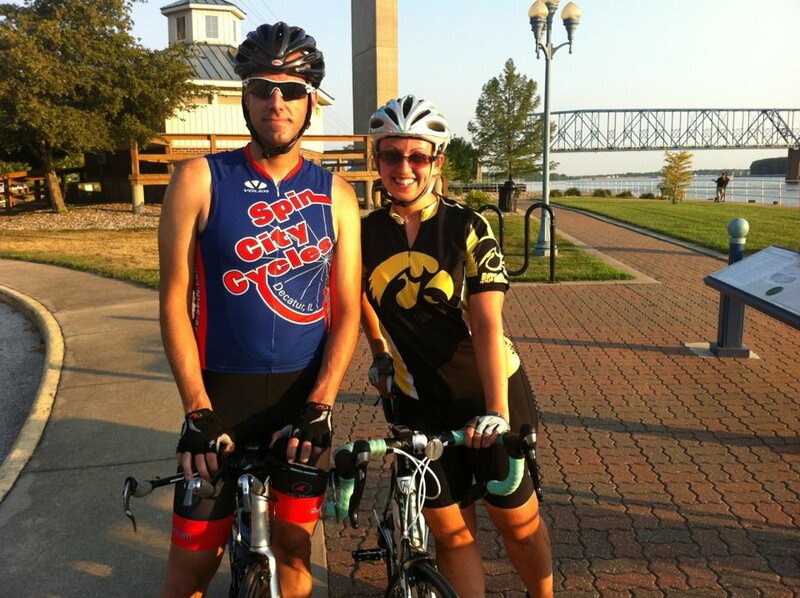 As most of you know, I’m headed off to RAGBRAI (Register’s Annual Great Bike Ride Across Iowa) next week. 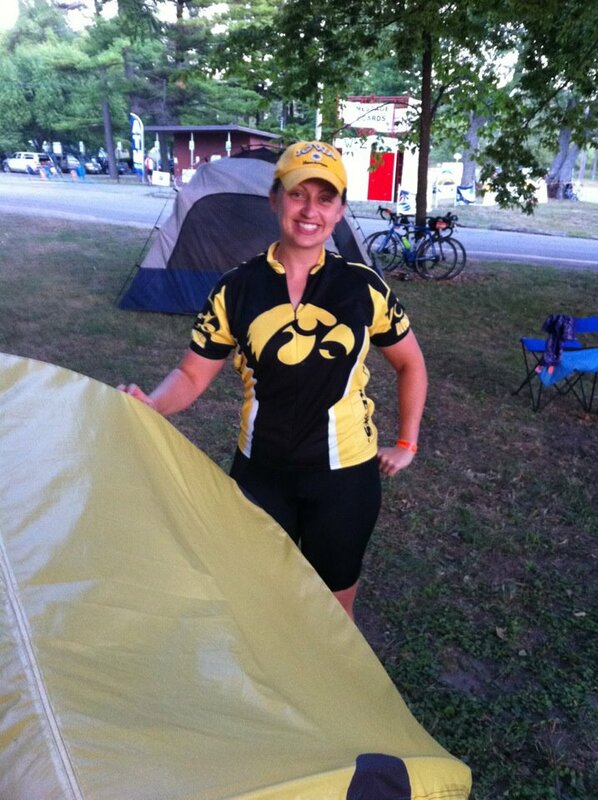 There, I’ll be tackling just shy of 500 miles and over 16,000 feet of climb (Iowa is decidedly NOT flat!) alongside thousands of other cyclists for the biggest, longest, and oldest bike tour in the USA. It’s a dream that started when my grandma’s restaurant was a rest stop on the route in 1992. I was 10 at the time, and I said that one day I’d bike across Iowa. Now I’m 30, and now I’m going to make it happen! Biking has to take a break a couple of days a week, so I’ve also been hitting the water for some kayaking! The best news about that is that I will be doing a lot of guiding with Kayak Quincy during the month of August. 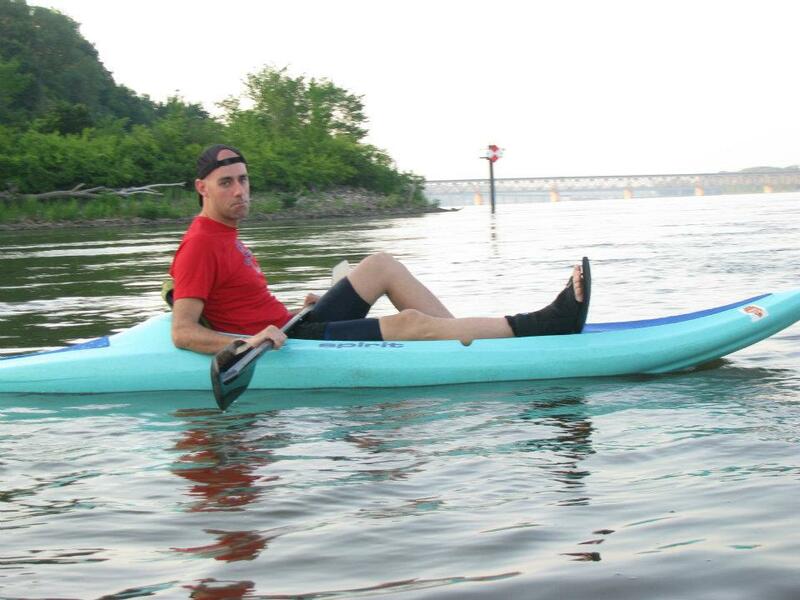 I’m especially excited to be leading three Ladies Night Kayaking Events. Details are not 100% set yet but the events are tentatively set for August 14th, 21st and 28th (all Tuesdays) at 6 pm on the Quincy Bay. It’s my personal goal to get many more female paddlers going on this super fun sport. It’s a great workout for your core, it’s not dangerous (I promise, you can’t get stuck and you will have a lifejacket, so being a good swimmer isn’t even a requirement), and it’s so much fun! My Ladies Night classes can have a maximum of about 12 people, and since he’s tagging along, Kevin will get to be my lovely assistant for a change! If you’re reading my blog and you already know you’re interested, you can send me a message on Facebook and I’ll reserve your spot. You’ll get all your equipment including lifejackets, instruction and around 2 hours on the water for $30 per person. I’ll be on KHQA’s Morning Show the first week of August to talk about the Ladies Night Events- so if you really want a spot on a specific day, you’re better off messaging me before my TV appearance! If you are not a lady or prefer a mixed group and you want to kayak with me, you may also message me and I’ll find a class you can get into! Also: Click here to read about one of my favorite kayak experiences to date- I helped guide members of the Quincy Park District along with Illinois Lt. Governor Shelia Simon on the river last year. Run for the Cross: Quincy’s only nighttime race! This event is unfortunately the same weekend as I’m on my big bike trip, but if you’re not cycling 500 miles, I suggest going to South Park and participating in Run for the Cross! The 4 Mile Fun Run/Walk benefits the Back to School Help Fair providing immunization, physical and dental exams, haircuts, and various school supplies to children whose families need assistance. Get all the info and register by clicking here! Mississippi River Run 5K and 10K will be held August 25th in Hannibal, MO. If you missed the chance to run over the river at Bridge the Gap, or you’re like me and just enjoy every chance you get to run across the river, you won’t want to miss this race! Click here to go to the event website. Quincy 5 Miler: If you only try one new thing this year, make it the Quincy 5 Miler Hand Powered Boat Race!! This race hasn’t been held on the Quincy Bay in 62 years… but we’re bringing it back baby!! the South Side Boat Club and Kayak Quincy are partnering to bring kayaks, rowboats, canoes and more to take on a course that was first run in 1872. Kayaks will be available for rent for the event on a first-come basis. I’m coming into the race with the eye of the tiger and high hopes! I may never win a foot race, but I’m planning on being competitive for this one! 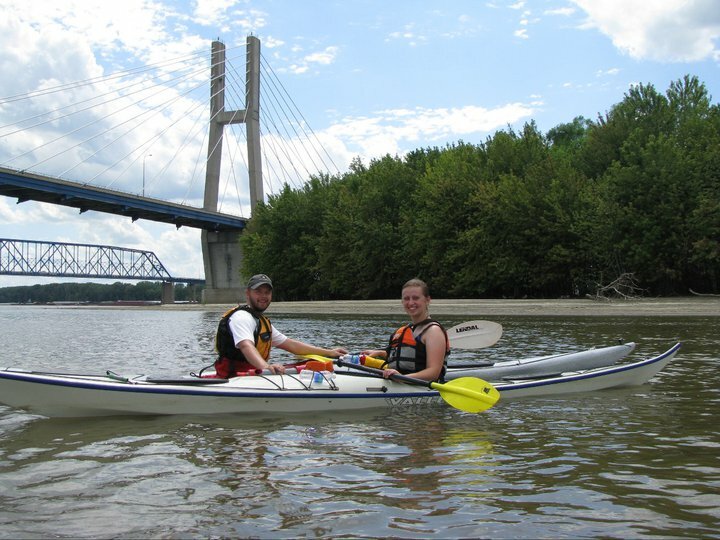 If you’re interested in trying the race but you’ve never paddled before… you should come try Kayak Quincy. I REALLY REALLY want to have a strong female representation at this event- so come to my Ladies Night classes and then get your booty to this race. For more info, click here. Too shocked to have the sense to conserve my precious oxygen, I turned to the runner next to me and gasped, “Is this hill seriously trash talking us? !” I should have saved my breath because I needed every bit of O2 I could gather for the climb up Lover’s Leap in the middle section of the Hannibal Cannibal 5k Run. The 16th annual Hannibal Cannibal was held this past Saturday morning in downtown Hannibal, Mo. More than 1,700 runners from 26 states braved temperatures that had already climbed into the mid-80s by 7 a.m. to participate in 5k or 10k courses. Each course began in downtown, headed up the highway and over the overpass, took a turn and then climbed the infamous 600-foot bluff known as Lover’s Leap. This was only my second 5k run ever, but I was feeling pretty confident at the starting line. I gathered with the other slower runners near the back of the pack, and, when the cannon went off, the runners surged forward and formed a great river several blocks long and four lanes wide. My iPod playlist was cued up to a Deadweather song, and I felt like I was making good time as I crossed the highway overpass. That’s about when the Hannibal Cannibal’s tag line, “It’ll eat you up,” began to make sense. Highway 79 from the overpass turns into a long, low hill. I’m going to say it’s about a 30-degree grade (though I’m just holding up my fingers to estimate, so I could be way off). The thing just goes on and on. I kept running, and it kept climbing. It was super hot, and I was kicking myself for leaving my sweatband sitting on my kitchen table back in Quincy. The course doubles back on itself, so the faster runners were all coming down the hill I was still trying to climb. I was jealous of those folks who had already made the turn. When that hill finally did let up, I was treated to a glass of lukewarm water, and then started making my way back down the hill. The relief was only temporary though, because I was approaching Lover’s leap. The “You Can’t Handle this Hill” sign was only the beginning of the Cannibal’s biggest weapon’s assault on me. The sign’s barb had me fired up, and I charged with renewed energy. Talk trash to me, will you, Hill? I’ll show you! But it just kept coming! The grade increased to what seemed like 90 degrees, and the next sign teased, “Feel the burn?” I did feel the burn, but I wasn’t about to walk. The Hill, unperturbed with my continued insolence, informed me, “Even your car can’t make it up this hill.” I’ll admit, the thought of my Camry and its very capable air conditioner caused me a great deal of mental anguish, but I was determined to keep going. MaryAnn Cornwell and Laura before the race. Suddenly I was there at the top. Some saintly volunteer had a water sprayer and I reveled in the cool mist as I jogged past. I grabbed a glass of water and then saw the Cannibal himself! He was gnawing on a bone that I assume was a human femur (or possibly a turkey-leg, but we’ll go with femur.) He was distracted! It was time to make a run for it!I dashed past the distracted barbarian and didn’t even look over my shoulder to see if I was being pursued! It wasn’t long before I was turning the corner back toward the finish line. I’d made it! It was hard, and it was hot, but I was very proud. I clocked a time of 39 minutes and change. That was slower than my Bridge the Gap time, but I’ll tell you this, I’m not a bit disappointed. Running the Hannibal Cannibal was every bit of the challenge that they bill it to be, and I’m excited to have survived in one piece. Also, congratulations to all the runners who participated in this race, especially my friends MaryAnn, Amy, Melissa, and Jeff. Well done, everyone!